We're excited to announce that we have added another vendor to the (already impressive) FPE Technology Showcase! 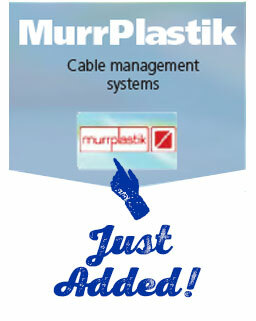 MurrPlastik, a manufacturer of really inventive and useful cable management systems is on board! We have added an additional booth. They will be there with products and expertise to answer your questions. The FPE Technology Showcase is happening next Wednesday! We are thrilled to be bringing you all the latest technology under one roof. Omron, MAC Valves, Bimba, Tolomatic, PHD, Piab, Universal Robots, QC Conveyors and (of course) FPE will all be there! We'll have a pig roast luncheon, valuable prizes and free gifts, laser engraving, seminars in both the morning and afternoon, q&a sessions and more! 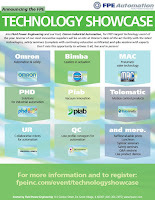 Sign up today for the FPE Automation Technology Showcase! It's FPE's biggest event of the year, and it's getting bigger every day. - Several of our most innovative suppliers will be on site at Omron’s state-of-the-art facility with the latest technologies. - Q&A sessions with experts. Don’t miss this opportunity to witness it all, live and in person! Production output doubled. Thanks, UR! 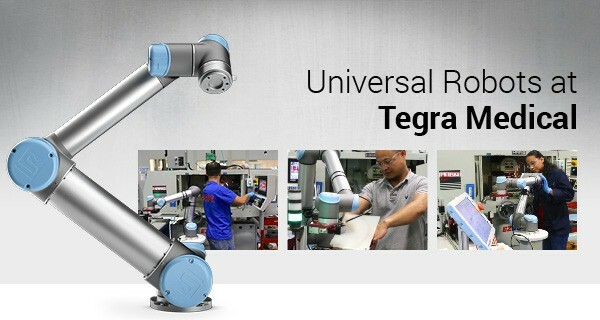 - Just one of the benefits Medical Device Manufacturer Tegra Medical experienced after deploying three robot arms from Universal Robots at their facility in Franklin, Massachusetts. The robots also freed up 11 full time workers, now handling more complex tasks, and improved product quality. ROI? 3-6 months. We were looking at cost, accuracy, ease of implementation and ease of use. The Universal Robots nailed it in all those areas. It was just far above and beyond what we thought anyone else in the market had,” said Tegra's Director of Engineering. We think you’ll reach the same conclusion. To schedule a demo, contact FPE today. We have a travelling robot we can bring right to you for a private demo.